Despite having restrained its initial captivating weirdness in subsequent installments, Elephant Games' Mystery Trackers has always been a hidden-object adventure series that's near and dear to my heart. In Mystery Trackers: Paxton Creek Avenger, the villain comes with his own bishi-sparkles, so you know it's going to be at least a little pleasantly crazy. Turns out he's upset at you, or at least your organisation, and as he believes the Mystery Trackers have gone about unpoliced for too long, he's abducted the leader's daughter... well, I mean, what else did you expect a Phantom of the Opera knock-off bad guy to do? Much less one uses "rascals" as a vicious insult and who sounds like he's two steps away from shouting "TUNNEL SNAKES RULE" before vanishing into the night. Solve puzzles, use powerful theater spotlight bulbs in puny handheld flashlights, and complete hidden-object scenes as you track the so-called Avenger to foil his doubtless dastardly plot! Like most present-day hidden-object adventures, Paxton Creek Avenger allows you to customise your own difficulty setting to make things as easy or hard as you please, at least as far as allowing hints and skips and the like goes, and comes with a helpful interactive map that will show you where you are, where you still have something you can do, and let you travel anywhere with a click. Some puzzles, though sadly not all, have both casual and hard settings, which is a nice touch, and of course you've got your trusty yap-yap dog Elf to help you reach certain items. 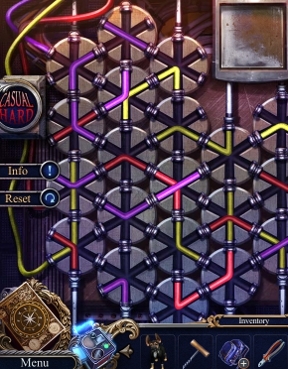 The game is, in other words, pretty standard when it comes to its gameplay, though fans of the genre will find it has a nice variety to its puzzles and manages to space its hidden-object scenes out quite well. On the whole, it's also hard to fault the game's presentation. The artwork is fantastic, it animates well, and the series still has some of the best voice acting around. The game is, however, perplexingly silent for long stretches of time apart from sound effects, mostly due to the fact that its musical pieces don't loop, which is a weird choice for a game with a musical theme and one that frankly makes it feel a little blander as a result. It doesn't help that the game is also extremely aggressive with its backtracking, sending you back and forth and back and forth, over and over, within relatively small areas all the time. But while it might not be the strongest entry in the series, Paxton Creek Avenger is still a Mystery Trackers game, and that means you can expect a degree of high quality that makes it pretty darn enjoyable. It's not quite as story-driven as some installments in the series, with most of the game being devoted to simply chasing the Avenger from place to place like an Adam West Batman villain, though it's not without its share of cheerfully campy twists and a thrilling sequence or two. The game picks up a bit once you finally manage to get out of the opera house and start following the villain to different locations, thankfully abandoning the whole "damsel who doesn't even have a name in distress" plotline in favour of exploring more places related to the Mystery Trackers themselves, which means a lot of fun secret-agent style activities and mechanisms. Regardless of the difficulty setting, it's still a little on the short side, and probably won't take most players longer than a few hours to speed through, though the bonus chapter in the Collector's Edition represents a nice chunk of extra gameplay. If you're looking for a hidden-object adventure with a sense of flair that will provide a thriller plot without a ton of violence and gore, Mystery Trackers: Paxton Creek Avenger will keep you satisfied with its flamboyant style, and tiny helper animals dressed in itty-bitty tuxedos. 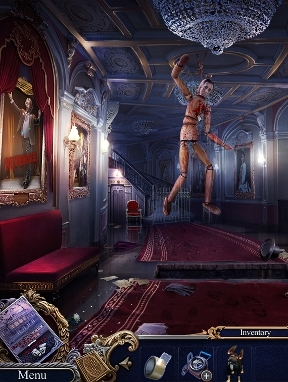 Which, really, is all I ever want from a hidden-object adventure game these days anyway.